3M Scotchlite 8830, 8886, and 8887 are for motorcycle jackets, helmets, saddlebags, boots, fenders, paniers, backpacks, satchels, etc. These reflective tapes are thick (15 mils) and sturdy and adhere well to heavy fabrics like Cordura, leather, hard plastic or metal shell luggage, and hard hats. They have an aggressive acrylic adhesive and are virtually untearable. Fluorescent colors provide great visibility during low light and foggy weather, and their reflectivity at night is brilliant. These 3M marking tapes are highly versatile and outstanding for providing visual conspicuity during both day and night. They are easy to cut and apply, but note that the adhesive should be allowed to cure for 72 hours before putting a garment into rigorous use. Specifications and application instructions for 3M 8830, 3M 8886 and 3M 8887 can be seen at the following link: 3M Specifications. 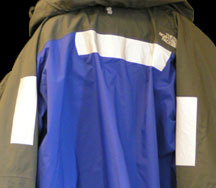 3M 8850 (below) is for application to raincoats (such as Gore-Tex jackets), rain pants, ponchos, rubber boots, and other waterproof apparel. 3M 8850 is a very thin (3.5 mils) and flexible retro-reflective film with a rubber-based adhesive. It has a clear peel-off liner on the adhesive side and a white paper layer covering the reflective surface. 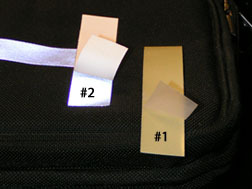 After the tape is applied, the white paper layer peels off to reveal the reflective surface. It is very bright, having a reflectivity of 500 Candelas/Lux/sq. meter. 3M 8850 will stay in place permanently, but is not recommended for application to clothing that requires washing. 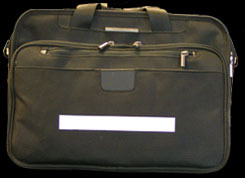 It can be used for temporary reflective markings on soft clothing like t-shirts and jerseys, which then can easily peeled off. It can be difficult to remove from heavier materials such as Cordura or Carhart jackets. Specifications and detailed application instructions for 3M 8850 can be viewed at the following link: 3M 8850 Specifications. Basic Application Instructions for 3M 8850: 8850 has both a clear plastic liner covering the adhesive side and a white paper liner covering its silver reflective side. Cut a piece to size and remove the clear liner to expose the adhesive (#1 above). Turn it over and lightly place the tape into position, then press and rub it down firmly onto the fabric over a hard surface. It is advisable to allow the adhesive to cure for 72 hours and reach maximum strength before peeling off the liner. Using your fingernail or an Exacto blade, carefully "pick" up a corner of the paper liner to begin separating it from the reflective layer (#2 above). Slowly peel away the paper liner by pulling it toward its opposite end to fully expose the reflective surface. You will then ready for the hazards of the night!